cHowever, with a new baby boy coming I have felt the need to do some creative things for his nursery and circle back to do some things for my sweet big baby's current room. So I am bringing you "Crafting in 15 For the Non-Crafty." It's short little crafting ideas that you can do even if you're crafting challanged. Last week I pulled together this shadow box in about five minutes. I bought two shadow boxes for $7 each at TJ Maxx. I grabbed my sweet boy's hospital bracelet, his little hat and this beautiful photo taken by Frame Photography. I arranged them in place. Pinned them and called it a day. It's so sweet and so simple. 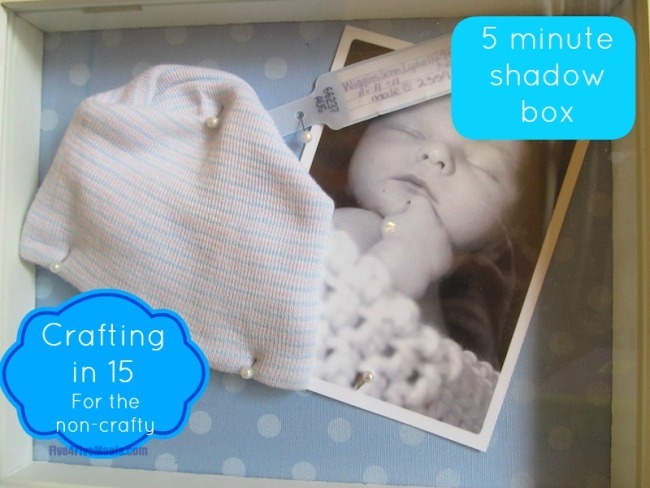 If you want some inpseration for some really beautiful shadow boxes look no further. Crafty Chic Mommy has these beautiful ideas. The Mama Dramalogues has this stunning one that is very personalized. Could this one from Mandi Tremayne Gallery be more gorgeous? This idea comes straight from Michael's and could very well be my favorite.